Taking your pooch to a dog-friendly beach can be a great way to beat the summer heat and enjoy a little quality time with your furry sidekick. But seaside fun in the sun can also pose potential health threats to your dog. Before bringing your pet on vacation, it’s critical to take safety precautions. 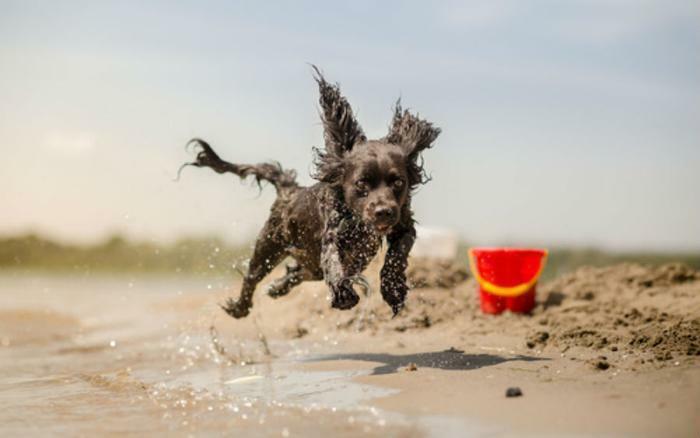 The pet experts at Petplan insurance say they see claims soar from summer days at the beach from dog-related health problems such as dehydration and blocked bowels. To minimize your pet’s risk of getting hurt or sick, it's important to know the dangers of sun, sand, and salt water, says Petplan’s staff veterinarian Rebecca Jackson. Here are a few dangers to steer clear of while at the beach with your pup. Sand. While you can't avoid sand, you can keep a close eye on your dog to make sure he doesn’t eat too much of it while digging. A little sand won’t do any harm if ingested, but large quantities can collect in the intestines or bowels causing a blockage, the vets at Petplan explain. Salt water. The ocean may look like a giant water dish in the eyes of your dog, but drinking salt water can be dangerous to pets. The most common side effect is diarrhea, but if they lap up too much, salt toxicity can become an issue. To keep your dog hydrated, bring along a collapsible water dish and fresh water. Heat. Heat stroke is one of the most common and most dangerous threats to beach-going pets, according to Petplan. It can take hold of a pet in as little as 15 minutes, and it can be fatal. To keep your pet safe, avoid bringing them to the beach during the hottest part of the day and be sure to provide ample amounts of both water and shade while there. The sun. Humans aren’t the only ones at risk for sunburn. Dogs -- especially those with white or light-colored fur -- can also get sunburned. You can protect your pet’s skin by applying a pet-formulated sunscreen to the bridge of the nose, ear tips, abdomen, and inner legs. Additionally, be sure to provide plenty of opportunities for shady naps. Strong currents. Even dogs that are pro swimmers should be monitored closely, as they can be pulled under by strong tides and currents. If they inhale water while struggling, dry drowning can occur hours or even days later. To keep your pet’s lungs fluid-free, bring a pet lifejacket to help keep their head above water.